Huge thank you to our former student and flossmole alumnus Christian Funkhouser for working on re-writing the Launchpad collector to use the API. The datasource_id for Launchpad in September is 342! Data files have been released for May 2012. Go check it out on our Google Code downloads page. --Free Software Foundation has been re-written from scratch to match their new layout. This graph shows a network diagram of the programming languages paired together by projects in Launchpad. The top 100 combinations are represented in the visual. For an interactive visual, click the image below and then click the "Recompute layout" button (connected dots). This chart shows the top programming languages pairs used by projects in Launchpad. 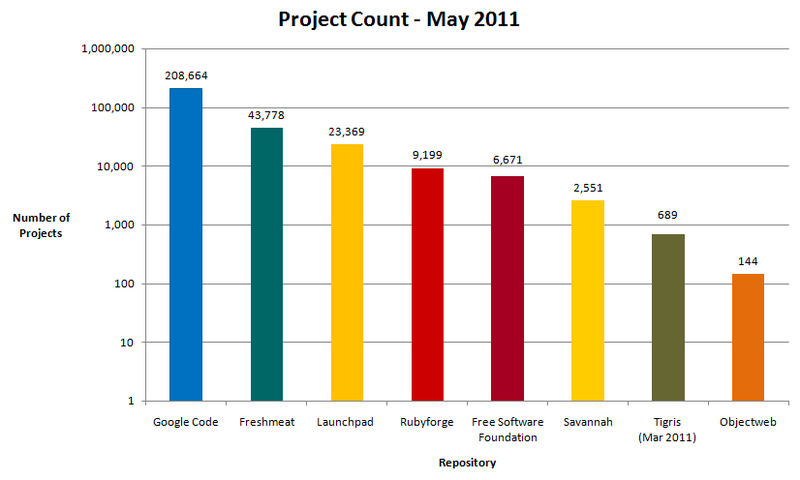 Description: This shows the top 30 bugs tagged in Launchpad projects as of June 2011. This chart shows the number of projects that FLOSSmole most recently collected from each repository.